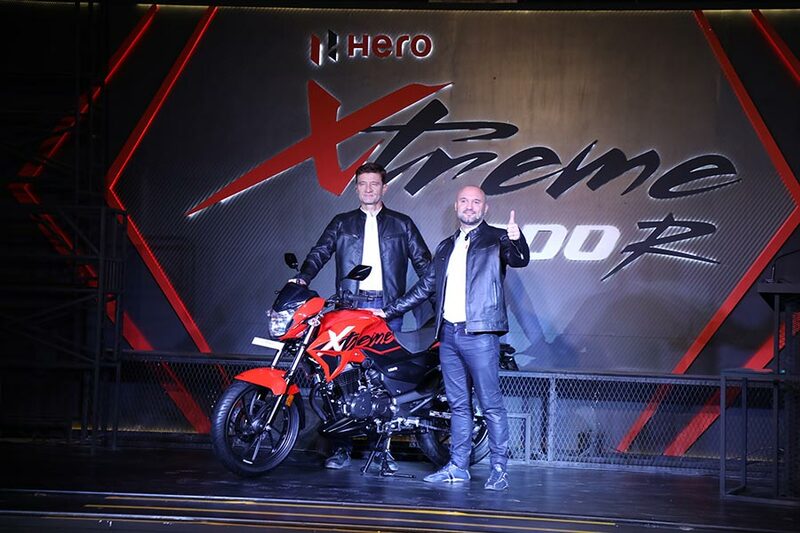 In keeping with its enhanced focus on products in the higher engine capacity segment, Hero MotoCorp Ltd., the world’s largest two-wheeler manufacturer, today unveiled the all-new ‘Xtreme 200R’. Aimed at strengthening Hero’s presence in the rapidly growing premium motorcycle segment, the Xtreme 200R will be available for sale across Hero MotoCorp dealerships in the country from April 2018. The Company will soon commence customer bookings of the Xtreme 200R. Positioned at the core of the Premium segment, the Xtreme 200R delivers unmatched real world performance and premium features. Thus, re-shaping the dynamics of the growing premium motorcycle segment in the country. The all-new Xtreme 200R with its muscular and aggressive styling exudes a Roadster stance. It is powered by an all new BS-IV compliant 200cc air-cooled engine, packed with intuitive technology and perfect riding ergonomics to deliver an exceptional performance to the rider. The new motorcycle has been designed and developed by Hero MotoCorp’s in-house R&D team, based at the Hero Centre of Innovation and Technology in Jaipur. The all-new Xtreme 200R is reflective of our product development capabilities and also demonstrates the strenuous R&D efforts that are underway at the Hero Centre of Innovation and Technology (CIT). 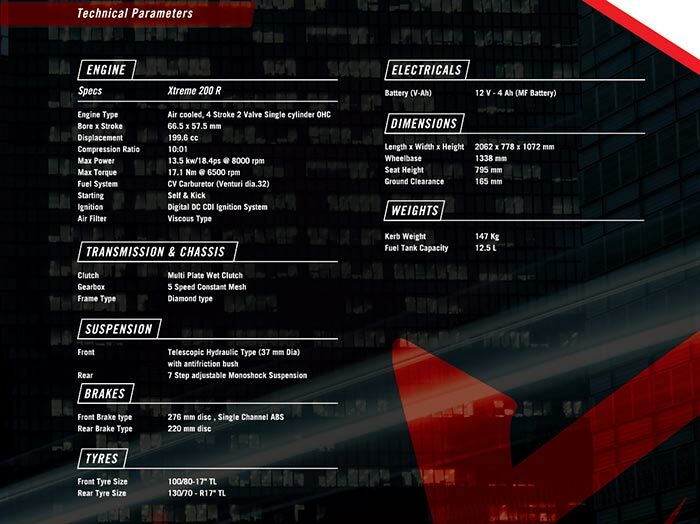 The new Xtreme 200R is the perfect amalgamation of performance, advance technology and masculine attributes. We also have a strong pipeline of new products for the rest of the year. While Hero MotoCorp continues to be the dominant market leader in the commuter segment, it is now focusing on the Premium segment with higher-powered motorcycles. The all-new Xtreme 200R is a bold and focused step towards re-shaping our presence in the premium segment. 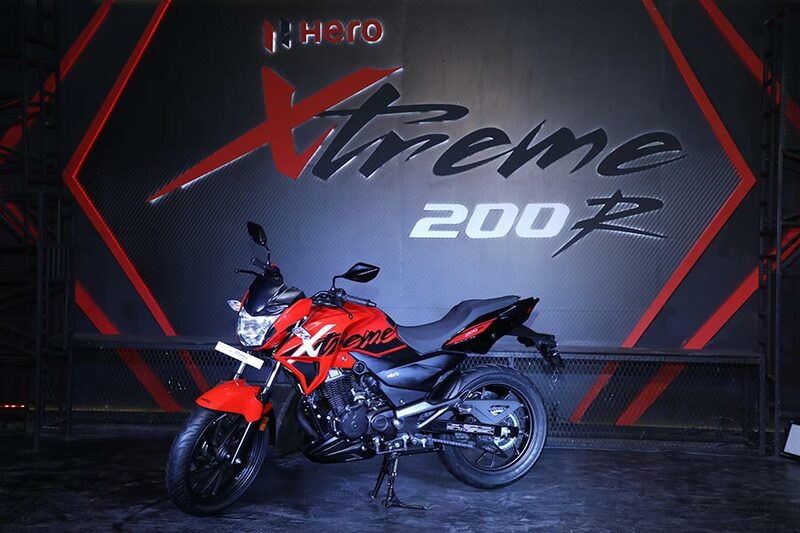 The Xtreme 200R is a real head-turner, which – combined with competitive performance – is going to appeal to the youth in India as well as in our global markets. This is only the beginning. From 2018 onwards, the focus for Hero MotoCorp in motorcycles is the premium segment, and we will continue to bring more products in this category. The all-new Xtreme 200R comes with a lightweight yet stiff Frame which offers precise handling in tight corners and utmost stability at high speeds. The carefully tuned Ergonomic-riding triangle between the handlebar, seat and foot-pegs offers perfect balance of agility and comfort. The new Xtreme 200R is a real head-turner with its muscular stance and aggressive styling. The bold Fuel Tank, sporty Headlight, eyebrow-shaped LED Pilot Lamps and LED Tail Lamp with guide lights, sporty digi-analogue information cluster and attractive dual-tone graphics add to the striking & distinct appeal of the motorcycle. In addition, the bike features a newly designed contoured seat for improved ergonomics and seating comfort for rider and pillion. In addition to the impressive design and style elements, the motorcycle also comes with a host of safety features, such as 276 mm Front Disc and 220 mm Rear disc Brakes system and an optional ABS system. The 37mm broad front fork ensures precise control while the 7-step adjustable Mono-shock suspension technology offers superior ride handling, cornering stability while adding to the style quotient. The 17” 130/70 wide rear radial tyre with performance tread pattern ensures enhanced road grip, cornering confidence and better braking control under all conditions.